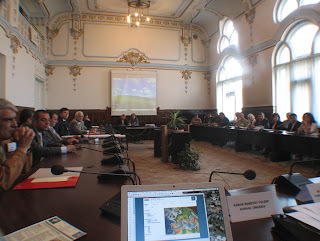 Chaired by Dr. Károly Brezsnyánszky, the National Committee on the International Year of the Planet Earth held its 2nd meeting hosted by the Hungarian Academy of Sciences. 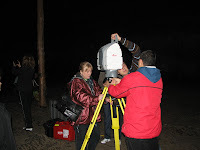 Preparation of the Opening Event was the major issue addressed. HUNAGI and its member institutions and organisations will be informed soon how to contribute. Notice: This HUNAGI Newsblog was visited between October 1-31 by 1077 visitors from 86 countries. Breakdown: Hungary 17,7% USA 11,1% Romania 8,7% Germany 5,9% UK 4,2%. This HUNAGI Newsblog had 6141 visitors between 2 August 2006 to 3 August 2007. The ClustrMaps illustrates the global geographical distribution. Governmental agencies, parliaments, global organisations, NGOs, universities and colleges as far as the private sector were identified among the visitors. Further HUNAGI blogs include the Newsblog in Hungarian at http://hunagi8.blogspot.com and some thematic ones e.g. Calendar. The HUNAGI Visual resources at www.hunagi.hu (Photo collection), http://picasaweb.google.com/hunagi.hu, http://picasaweb.google.com/gabor.remetey as well as http://hunagi18.blogspot.com are also frequently visited. 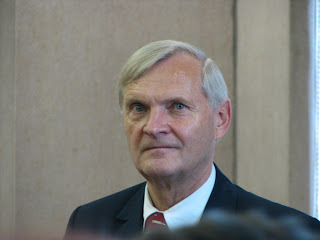 Former German Astronaut and Professor of the University of Stuttgart, Dr. Ernst Messerschmidt delivered a lecture during his visit in Budapest. 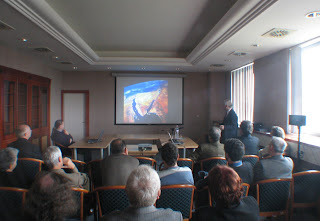 The event was organised by the Vice-Rector of ELTE and Chair of Cartography and Geoinformatics Prof. Dr. László Zentai. The Hungarian Astronaut Bertalan Farkas introduced a NASA video on the International Space Station. In the discussion part Prof.Messerschmidt expressed his view about the importance of knowledge and capacity building. Autodesk, ESRI Europe, NAVTEQ and Intergraph on the Board representing the private sector in Europe. AGI will leave by 31 December. Ihlet has been acknowledged . The WAG International Affairs were presented by Bruce McCormack including the activities in Eastern Europe. Ihlet's Workshop in Brussels was explicite mentioned and evaluated as a good start but a lot to do. He circulated his contribution to the successful meeting organised by the Embassy of South Africa in Brussels entitled "Geoinformation in development cooperation: towards a policy and implementation framework". That meeting was attracted organisations such as the European Commission (AIDCO, DG Research, DG Development), UN (UNGIWG, WHO, GEOSEC), USAID, JICA, EUROGI, EIS Africa, Universities, Embassies of Nigeria, South Africa and Kenya as far as National GI Associations as IRLOGI and AFIGÉO. (HUNAGI was not able to participate due to the schedule conflict with HUNAGI FORUM held on the same date. ) The Data WAG related issues presented by Sandro Gizzi were also discussed. After EUROGI the ExCom Meeting, President Prof. Mauro Salvemini introduced his new vision related to the reshaping, restructuring of EUROGI in order to strengthen its influence and acknowledgement. 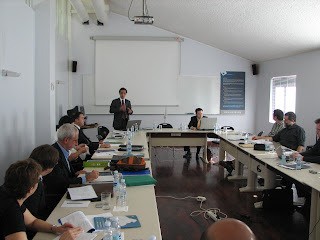 Secretary General Joao Geirinhas made in-depth overview on the activities of the Organisation. 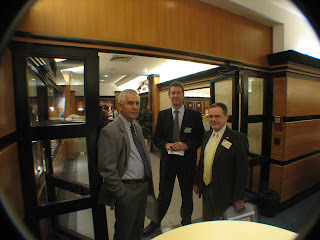 The host institution made excellent arrangement both in professional content and the Meeting-related logistics. Superb presentations were delivered by Professor António Camara of YDreams on Trends and new visions, followed by Anabela Pedroso of the Agency for the Administrative Modernisation who addressed the e-Government related aspects, finally by António Arnaud of the New University of Lisbon, who introduced the European project "Addresses", which is participated also by Hungary via FÖMI. All the contributions will be evaluated and synthetized and the outcome will be streamlined by a team of four (IRLOGI, SNIG PT, Autodesk and ESRI Europe). More news with references will be added asap. Text will come soon. Please visit also www.unsdi.hu for further reports. Yesterday the meeting was devoted to the WGISS contribution to GEO, but also some liasion reports have been presented including ICU, CODATA, CCSDS and eGY. Today the series was continuing wth presentations of the host institution DLR, NASA, GSDI, JAXA, the Chinese NRSC and Thai Agency GISTDA, NOAA, USGS and GFZ. The 2nd working day of the CEOS WGISS-24 was almost entirely devoted to the enabling advanced technologies related to grid processing and sensor web developments including real applications as Tisza river monitoring in Ukraina-Slovakia and the Frascati Living Lab. 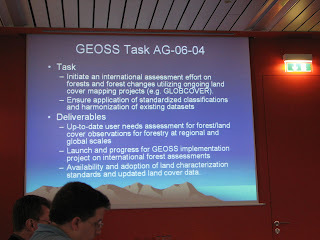 Nearly 40 experts from all over the world representing regional and national space agencies, academia, prime contractors and organisations such as GSDI Association came together in Oberpfaffnhofen, Bavaria to attend the 24th Meeting od CEOS WGISS. 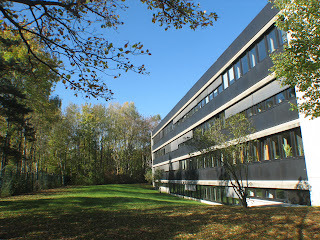 Te hst institution is the largest R+D institution in Germany having a staff about 5200 among them 2500 scientists and 500 *hd students. The Meeting was opened by Chair Ivan Petiteville of ESA ESRIN and Günther Schreier of DLR. Al Gore's vision was the basics the Digital Earth initiatives having a series of international symposia in Beijing, Canada, Brno, Tokyo and Berkeley, Calif. HUNAGI joined in 2003 in Brno to the community and today keeps excellent working relation with the prominent International Society of Digital Earth established in Beijing in 2006 by the support of the Chinese Academy of Sciences and the international Digital Earth community. 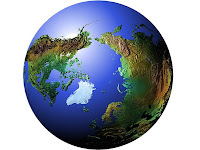 Please search for the keywords Digital Earth and HUNAGI on the Internet. 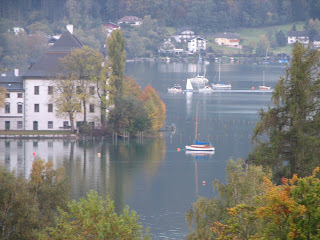 Now, just travelling to Ober-pfaffenhofen to attend the 24th CEOS WGISS Meeting hosted by the German Aerospace Center DLR stopover was made in Seewalchen am Attersee to put this spot on the blog. 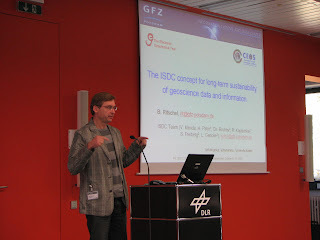 More on the WGISS and the relation with the global/regional and local spatial data infrastructure soon on these pages. HUNAGI is member of GISIG since the mid of the 90's. FUTURE PERSPECTIVES OF GI FOR ICM Genoa (IT), November 21st - 23rd, 2007.On the ECO-IMAGINE web site ( www.gisig.it/eco-imagine ), you can find:- the announcement of the Conference- the outline of the Conference sessions - the registration formWe are glad to remind you as well that an ESRI Award is organised also within the final event.All the participants interested in applying for the ESRI Award can find detailed information on the ECO-IMAGINE web-site. Finally, we remind you that Marie Curie grants are available for supporting the participation of early stage and more experienced researchers in the conference.The call for grants and the forms to be filled in are available on the above-mentioned web-site.We take the occasion to inform you that the conference is devoted to the memory of Prof. Adalberto Vallega, President of the International Geographical Union, founder of ICCOPS, and scientific promoter of ECO-IMAGINE. In particular, part of the event is dedicated to present some outcome of his scientific work and his research achievements. We kindly ask you to forward this message among your colleagues.Best regards,GISIG & ICCOPS Staff , GISIG - Geographical Information Systems International GroupVia Piacenza, 54 - 16138 Genova ItalyTel. +39 010 8355588, Fax. +39 010 8357190E-Mail gisig@gisig.it http://www.gisig.it "
Member of the EU INSPIRE Commission Pál Bozó of MoEW shares his views with the participants. 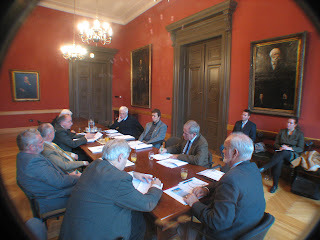 The inaugural meeting was hosted by Prof. László Zentai, Head of the Chair of Cartography and Geoinformatics at the Eötvös Loránd University of Sciences. As Leader of the Task Force, Ms. Lilla Lukács (Research Assistant at the Institute of History, Hungarian Academy of Sciences) was nominated and unanimously agreed by the participants. More news soon. 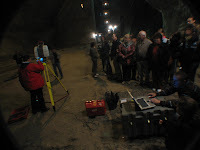 One of the most advanced measuring tool surveying the objects and indoor space the laser scanner of Leica was applied inside the Rudolf (St.Nicholas) Mine in Turda. 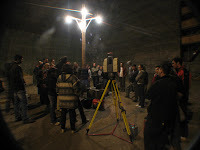 The surveying experts of the Timisoara based company Black Light (actually an authorized Autodesk and Leica value added reseller: www.blacklight.ro) made the unique application to demonstrate the applicability of the Leica Scan Station system even in exteme environment. 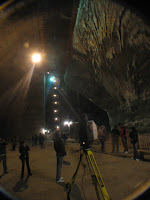 The inner space of the Rudolf Mine closed in the early 30's of the last century is 38 m high, 80m length and 50 m wide. Demonstrating the excellent acustics as special feature of the inner space, as apetizer for the in-situ measurement, the Transylvania Quartett made an excellent performance highlighting both classical and traditional local works. In the Celebration Hall of the Kolozs County Municipality more than 70 experts and decision makers came together today to attend the 3-day Workshop. HUNAGI representative was the first speaker with his presentation "Euro-atlantic Roundview" covering the major institutional networking related to SDI in country, European and global level.